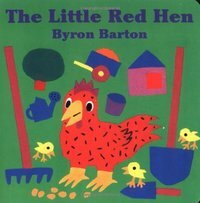 A little red hen grows grain, threshes wheat, bakes bread, and feeds her chicks--all by herself, without any help from her lazy friends. Young readers will laugh and learn a valuable lesson about teamwork from this classic tale! This board book features sturdy pages and is just the right size for toddlers. Byron Barton's simple words, bold images, and imaginative use of color have made his many picture books perennial favorites with young children. This retelling of the well-loved folktale "The Little Red Hen" continues to draw in preschoolers with its humor and bright primary colors.